I read it once, twice, and then three times before I scrolled through the comments of the person who had posted the picture. The majority, if not all of the replies were "lol". Prior to Sonzee I would have felt the thunderstorm brewing within, but I would have continued on with my FaceBook trolling, and glanced back occasionally to view the incoming replies. However, thanks to good old CDKL5 I refuse to let the minority opinion go unheard, whether I am the only person who feels this way or not. I decided early on in my life that medical school and I would not be a good match. With my easily triggered queasiness when ketchup gets on my finger, I decided it would be best for the public to not be subjected to my presence in a bloody emergency. I simultaneously decided that at the earliest possible moment I would attain my MRS and I guess based on this meme, the more "uneducated/untrustworthy" route of being a plain old MOM. I come from a family of medical professionals, my father a MD, and my mother a NICU nurse. My parents felt it best for me to have as many opportunities as possible and so they encouraged me to attend college and then further my education with obtaining a masters degree. I chose to become just a speech language pathologist, but again, this by no means qualifies me for making those more difficult diagnoses that I would no doubt have learned about had I attended medical school. I should probably call a MD when I read about them rather than learn more about them when I place them in the google search bar. When my husband and I had difficulty starting a family and no doctor would give me the time of day because we had not been married a full year, I am saddened to say I turned to good old google to check out any possible red flags. Shame on me for not listening to the doctor who didn't bother to run any tests on me because I could still be suffering from an undiagnosed thyroid problem, but hey, at least the offices' nurse practitioner knew what she was doing...I hate to think what google might have shared with me. It is a great thing that when I finally became pregnant it was 5 different high risk doctors who diagnosed my unborn child with IUGR even though every test confirmed there was nothing going wrong inside the womb (you should probably call your doctor if you don't know what the acronym stands for, because I would hate for you to have to turn to google). Our oldest is still just a petite little girl, just small for her age, no health problems during or after delivery thankfully. 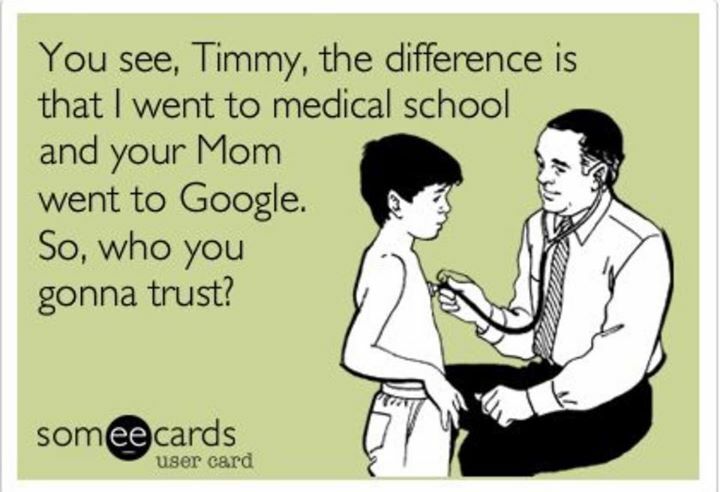 I am so glad we did not rely on google when it gave us other potential reasons for her being small; it was much easier to be stressed, scared, and upset along my highly anticipated journey to becoming a mother, because hey, all my doctors graduated from a medical school. I will admit google has betrayed me once or twice; when I panicked over my first having autism or being developmentally delayed. When I do turn to google I know to take a lot of what pops up with a grain of salt, however, it's a complete shame I used the search engine to double check car seat installation and proper buckling of my child, because our pediatrician failed to show us how. It was also on google that I learned more about furniture tip over safety than in any doctor visit during her six years of life. It is also unfortunate I turned to other mothers without an MD to bounce ideas off, check common symptoms, and to share first hand experiences. What am I thinking as I still do this? I will simply assume this doctor is bombarded with patients who enter the office and present a list of potential diagnoses based off their google search that are from out in left field. I can give the benefit of the doubt that the doctor did not intentionally mean to come off as disrespectful, arrogant, and a know it all. Did this doctor know that in the middle of the night google is the quickest method for a scared parent to be reassured or for a nonchalant parent to get the push they need to take their child to the ER? Did he/she know that it can take an hour or longer for nurses to give a message to the doctor when a mom calls the office concerned about their child? Google can give us a reply in 2 seconds and calm our fears much quicker. 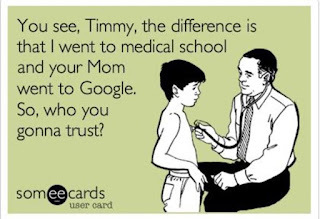 I actually know of doctors who post helpful information on the internet that shows up through the google search engine? What I find most disturbing and disappointing is the choice of words in the final phrase, "so who you gonna trust?" (Side note: Do medical schools accept papers with the word "gonna" written in them?) This must be a highly intelligent doctor who knows everything about every medical condition, disease, and anomaly there is; so to this doctor I ask. Do you know the ins and outs of CDKL5, SCN2A, or MECP2? (After learning our fourth child had CDKL5 her own neurologist admitted she had never heard of it and googled it herself.) When a child throws up and has a fever do you know without a doubt what their symptoms indicate? Do you know which test that you run will come back with a POSITIVE test result? Can you tell from looking at one of your patients that they have a tumor growing on their brain, in their stomach, or on their liver? Do you tell concerned parents to brush off concerns of childhood cancer when their child's symptoms are textbook for a stomach bug, parasite, or the flu, when indeed it is cancer? I could continue my questioning, but I am hopeful this doctor can see my intent. I personally am aware of all those situations listed above where a simple, non-medically educated, untrustworthy mom knew those answers but her child's pediatrician did not. While I am filled with anger that it is insinuated doctors know everything based solely on course work, taking an exam, residency/internship, and a piece of paper; what I feel more strongly towards this doctor, is pity. If this doctor really think he/she should be trusted over a child's mother, clearly the hundreds of thousands of dollars spent towards obtaining a medical school education were nothing more than a complete waste.